Liverpool’s starting line-up for the crucial clash with West Ham United in the Premier League has been revealed – and Adam Lallana starts in the centre of the pitch. Both Jordan Henderson and Gini Wijnaldum have knocks and are therefore not included in the squad, hence why the number 20 has been chosen. Lallana will be joined in a midfield three by Fabinho and Naby Keita – a big opportunity for the pair of them. 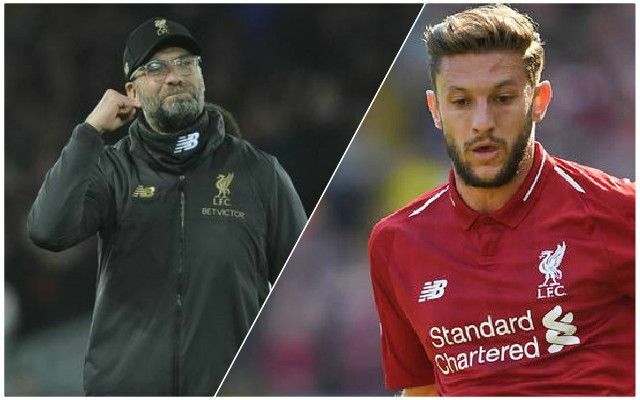 Jurgen Klopp is a massive fan of Lallana, but even so, it was a surprise to see his name on the team sheet as the following tweets show. It’s certainly a huge night for the Reds man. Lallana is a bizarre inclusion. Huge game for him. Lallana starting could allow Shaqiri to make his trademark big impact off the bench. I’m even more nervous now. A mixed reaction, it’s fair to say, but Lallana will need to perform tonight. He could well prove a lot of people very wrong – we’ve certainly got to hope so. There are 14 massive matches between now and the end of the season and every player will need to play their part, starting tonight.